Talk to any self-respecting European car enthusiast and they will no doubt praise the work of Ford over the past decade. True, Ford’s European branch has done a brilliant job keeping itself current among potential car buyers, but for various reasons, the magic has long been denied entry into America. Fortunately, the head honchos at Ford revised their grand plans, and we no longer have to bemoan our station in life as second-class car owners to the Europeans. The 2012 Ford Focus is the most recent addition in a line of vehicles that includes the Fiesta, the Transit Connect, and the forthcoming C-Max. In fact, it’s hardly recognizable from the outgoing generation. A new interior and exterior breathe life into the Focus, and the drive quality is superb for a vehicle in its class. If that weren’t enough to pique your interest, take a look at those gas mileage numbers: at 38 mpg highway standard, the Focus is up there with the best of the fuel savers. 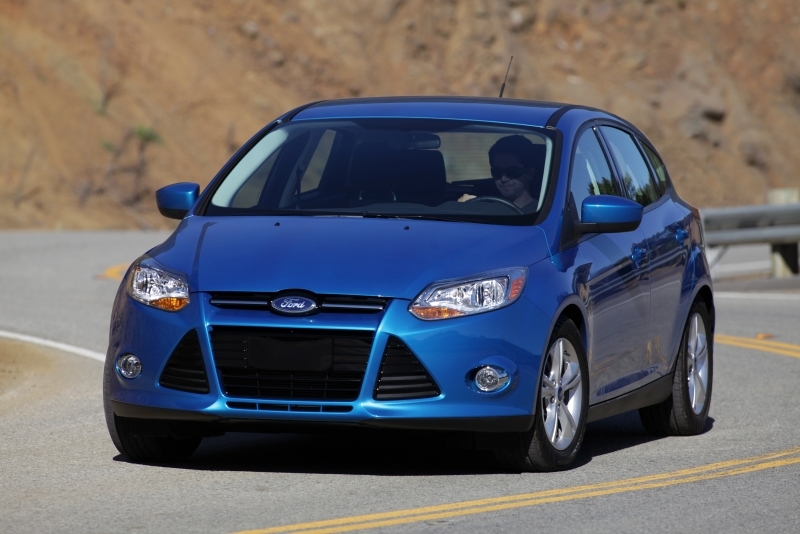 Dramatic improvements across the board make us want to add the 2012 Focus to everyone’s shopping lists. This Ford has the looks and style to rival the competition. Drive quality is excellent. 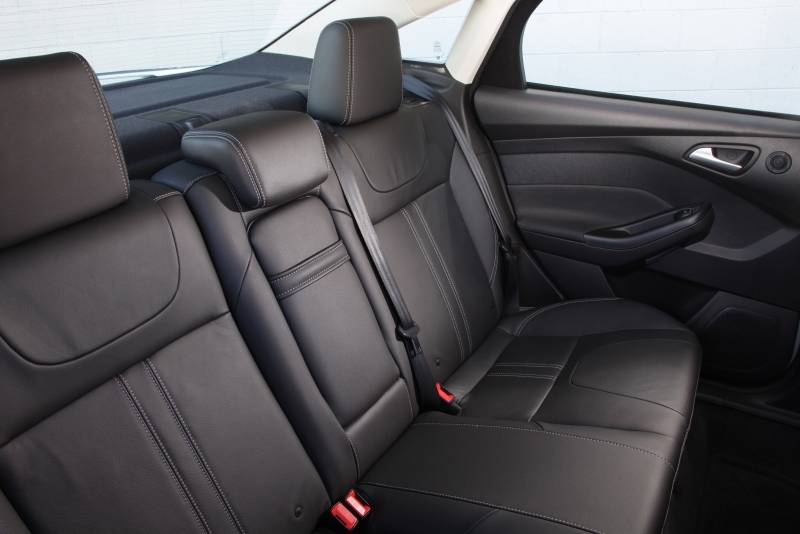 The interior fit and finish is among the best we’ve seen in a car of this price range. 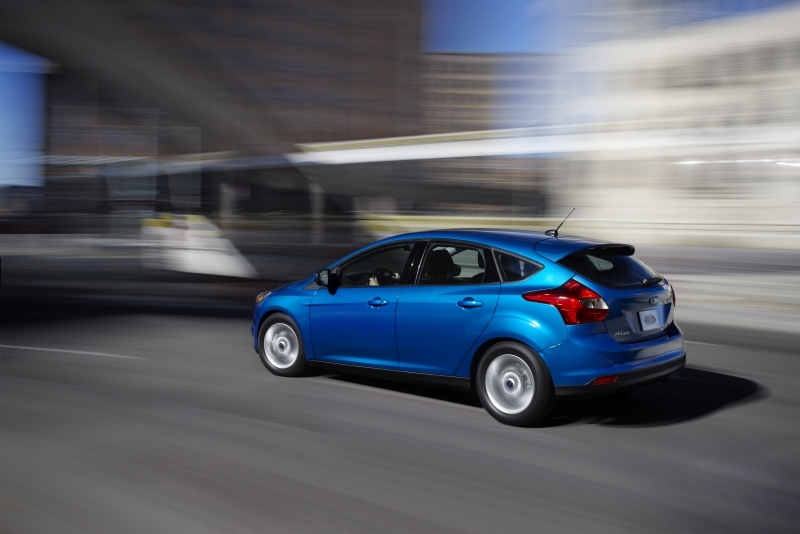 A huge amount of available options, including a hatchback or sedan body style, means there is a Focus for everyone. Highway gas mileage of up to 38 mpg is fantastic, and a fuel economy package ups it to 40 mpg. If your only impression of the Focus’ drive is from the last-generation’s sullen, underpowered performance, you’ll be blown away by the improvement. This new Focus is competent in a variety of drive situations, and we came away impressed by such qualities as the immediate throttle response, which helps the driver feel every bit of the 2.0-liter’s power. It’s a punchy little engine, one that delivers plenty of power without sucking up too much fuel. The auto transmission finds gears easily and the gearing helps to maximize the amount of power on hand. Steering feels connected and the handling prowess makes cornering a breeze. A MacPherson strut setup holds up the front-end and keeps understeer to a minimum, while a Ford-derived Control Blade multilink keeps things under control in the rear. Add the optional Titanium Handling Package, a must-have for driving enthusiasts, and you’ve got a solid performer on your hands. 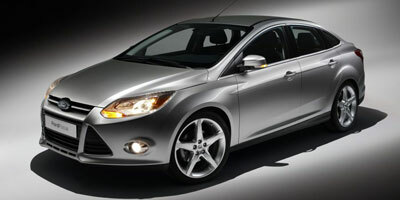 A completely new 2.0-liter, direct injection four-cylinder engine powers the Focus. Its 160 horsepower and 146 lb-ft of torque provide enough enthusiasm to scoot you around town at a reasonable pace while keeping your conscience clean and gas budget low. Ford’s quick changing Powershift six-speed dual clutch automatic is their most efficient to date and the Titanium’s only transmission option. For other, lower end models, a five-speed manual transmission is also available. Fuel consumption is down dramatically thanks to an economical engine, transmission, and a refined shape that slips through the air like a fish in water. Official numbers put the most fuel-efficient trim, the SE with the Super Fuel Economy (SFE) package, with low rolling resistant tires at 40 mpg highway. The Titanium trim sits a bit lower on the environmental totem poll—supremely efficient nonetheless—at 28 city and 38 highway. Even at its least efficient, the Focus still returns 26 mpg city and 36 mpg highway. Among the huge number of available options includes the Parking Technology Package which, like that of systems found on cars three times as expensive, uses a backup camera and radar sensors to help steer you into a parallel parking spot, hands free. 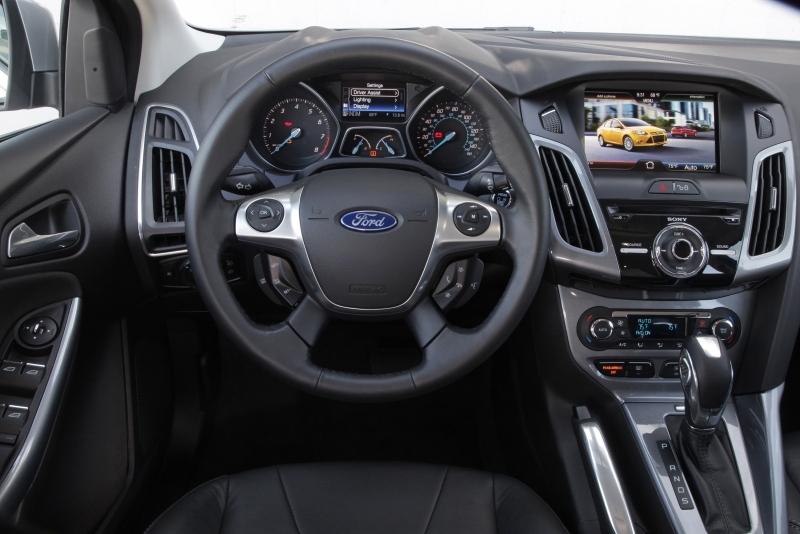 MyFord Touch system is new to the Focus, and the eight-inch touch screen houses a quartered display for the different systems in the car, including phone, music, navigation, and vehicle information. Designed to mimic the intuitive controls of a joystick, the system is actually a bit complicated to use and takes time getting used to, especially if you’re not computer savvy. However, SYNC is still as amazing as ever, and with its voice activation getting better with each generation, it’s even easer to use. Interior quality is far beyond anything we have seen in a Ford up until now. Soft touch plastics and high-quality trim adorn every inch of the cockpit, making it a joy to be in at any speed. The cabin is generally spacious, though legroom is tight in the back and the driver’s seat feels more cockpit-like than roomy. An LCD touch screen houses most controls for information and entertainment, and there is an additional screen in the instrument panel. The exterior design is completely new, from the huge, slatted front grille to the dramatic rear lights. Ford has thrown out all of the old styling cues, opting instead to mimic lines seen first on the smaller Fiesta and soon on many more of their lineup. The five-door hatchback returns to the Focus this year and provides more cargo space than the four-door sedan. The Focus S, equipped with four doors and not much else, starts at a slim $16,500 and sits in line with a crowd of competitors like the $15,800 Mazda3, $16,995 Chevy Cruze, and Hyundai Elantra. Most of the competition’s prices can gather steam quickly, but it’s still a little jarring to hear that a fully loaded Focus Titanium rings in at just over $27,000. Taking from the Europeans has always been something Ford of America avoided, for whatever internal reasons. And the previous Focus iterations suffered because of that. This Focus – a truly global model – shows the American market that small, fun to drive cars can be luxurious and well appointed.